We’ve had the chickens for maybe 8 months now. They are funny creatures– much more sociable than I expected. They come running if you enter the back yard when they’re out — always think you may have a treat for them (vegetable scraps, bread, or best of all, yogurt (!?)). Sarah rigged up this stylish and ingenious door for them the other day. Unfortunately, they so far seem incapable of figuring out how to go through it. Or rather, they will come back into their enclosed run — going “into the toilet,” so to speak — but don’t understand how to do the other way. Sometimes I do think that they are kind of dumb. But really, that’s an anthropomorphic way of thinking. They just have a very different intelligence than ours. On the other hand, if we think of intelligence as a form of cognitive resourcefulness outside of or beyond specific “scripts,” it does seem fair to say that they don’t have this in abundance. They do, and like to do, certain specific things: explore the yard hunting for seeds or other food, dust baths (these are hilarious to watch), being together in a group, being able to go to sleep when and how they feel like it (they all huddle on their roost in the hutch together). Certain activities clearly satisfy their urges, and some things scare them. What scares and does not scare them can be funny. For example, a visiting dog barking ferociously and slavering at them through the fence bothers them very little. But Sarah once came into the yard and shook out a tablecloth, and they freaked out and ran squawking for the corners of the yard. Our theory is that what most scares them are raptors– hawks, eagles, falcons, etc. I also think it may be the case that they are “programmed” to count on a rooster to guard them from certain earth-bound classes of threats (like dogs), so they don’t need to worry about those. But for whatever reason — I guess maybe it makes sense — every hen needs to look out for threats from the sky for herself. Thus the terror of the shaken tablecloth. yesterday it was about to rain, which I hand;t picked up on–I saw the clouds but didn’t realize a real form was coming, OUI was p cleaning the coopm so the chicks and chickens could;t go indoors. They went totally ballistic, clucking anxiously ignoring offers of food, etc. Fibally got the cop sorted out and opened the door and zipppp! in they went, clucking fretfully. So, highly developed air pressure detectors? I have a love/hate relationship with chickens. Or rather – I don’t think I”ve got over my teen disdain for them since it was my responsibility to look after them when my mom was away which was quite often. I used to throw jelly beans for them to eat merely to watch them peck at them, get them stuck on their beaks and then desperately try to get them off. I also found it amusing (in a way that only a teenager could) that they would come running if I threw something (anything) into the yard. Including gravel. I threw a lot of gravel in to the yard. wow that’s cool! 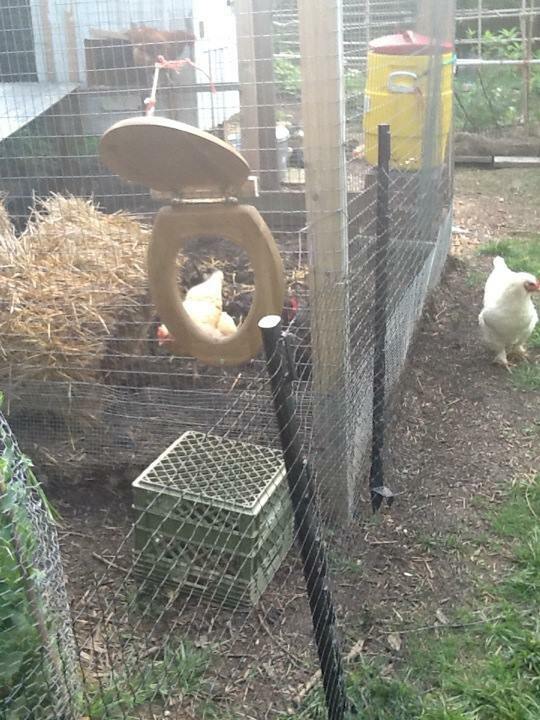 I don’t think our chickens can do that. Many people seem to have somewhat negative associations with chickens. Ours are really quite sweet, though. Of course, getting the 4-5 fresh eggs a day helps make us feel well-disposed towards them.